Do you have a favorite love song? 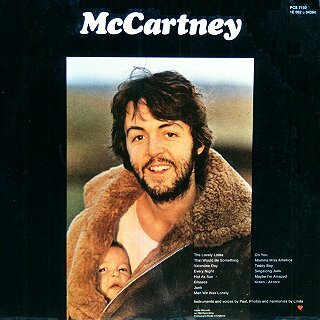 My favorite changes from time to time, but I always seem to come back to "Maybe I'm Amazed" by Paul McCartney. There were several versions of this song over the 1970's. The original was released as a music video in the U.K. in 1970. It is all music and photos of the McCartney family, and it is beautiful. Paul McCartney did not want to release "Maybe I'm Amazed" as a single, although it appeared on his McCartney album (1970) and also Wings Over America (1976). The single was released in 1977. Paul McCartney has said that this is the song he wants to be remembered for. Here is the original video. I hope you enjoy! My husband would probably be ashamed, but I did not realize who sang that song! It's a good one though (even though I don't love classic rock). Thank you for this post, as he is my all time favorite!! I could listen to him all day long and not get tired,he is just a fabulous musician/singer. My favorite song of his (if I had to pick one)would be Listen to What the Man Said- I just love that song!! Thanks for your comments! I am also a big Paul McCartney fan -- and a Beatles fan too. This is my favorite of all his solo songs.